Can raytracing be used to imitate the behavior of light to a higher degree? Raytracing "sees" the pixel on the other side of the screen; but doesn't this mean the rays traced can be computationally reflected and refracted imitating the properties of actual light? It'd be exciting if it were possible. Any visual scene possible outside computer graphics will be possible just using physics equations. You are late by about 35 years. This was addressed in the historical paper "Whitted, T., An improved illumination model for shaded display. 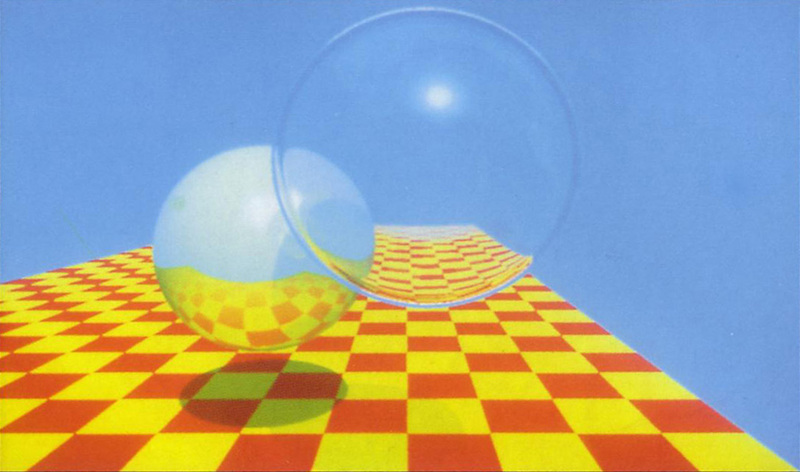 Communications of the ACM, Volume 23 Issue 6, June 1980, Pages 343-349", using ray tracing. Since then radiosity has been introduced to better deal with diffuse phenomena. Correct physical modeling of the image formation process was discussed six years later in the seminal "Kajiya, James T. (1986), "The rendering equation", Siggraph 1986: 143". Raytracing is one of the techniques that trace the light as it moves through the scene. This can, depending on the implementation, also include effects such as refraction, reflection and scattering. Raytracing and similar techniques (see Monte-Carlo Pathtracing for example) all are based on the idea to solve the so called rendering equation. The equation is a long known equation that describes the physically correct amount of light we can see for at each point (this means mathematical infinitesimal point, not pixel!). By (approximally) solving this equation the mentioned rendering techniques are indeed able to render "all" scenes. The only real limiting factors are that it is hard to solve the equation for some effects and the huge amount of computation you need to solve it. Not the answer you're looking for? Browse other questions tagged raytracing reflection or ask your own question. realtime dynamic reflections, which way to go?